Sure, you can leave your Apple Watch resting on a bedside table in your hotel but how easily does it fall off during the night? Exactly. Slotting its magnetic charging puck means it’s an uneven surface that’s liable to cause it to slip. Each of these Travel Stands keeps it upright and ideal for leaving in Nightstand mode overnight, while still correctly charging it. 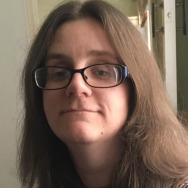 Here’s the pick of the bunch. The joy of a solid travel case is that you don’t have to worry about any of your Apple Watch accessories getting damaged while you travel. That’s why the Twelve South TimePorter is such a great purchase. 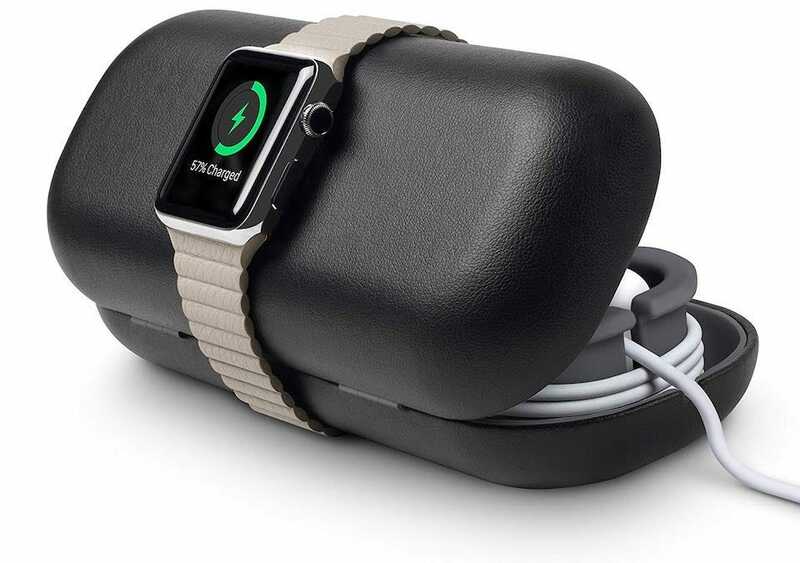 It’s a long case that has enough room for the charging puck, a power adapter, and any extra wrist bands you require. It also has a built-in spool so you can easily wrap your cables up neatly and safely. And of course, it makes for a good travel stand. Either opened or partially closed, it’s possible to slide your Apple Watch on to it so you can easily see the time from any angle. It’s a good all-rounder. 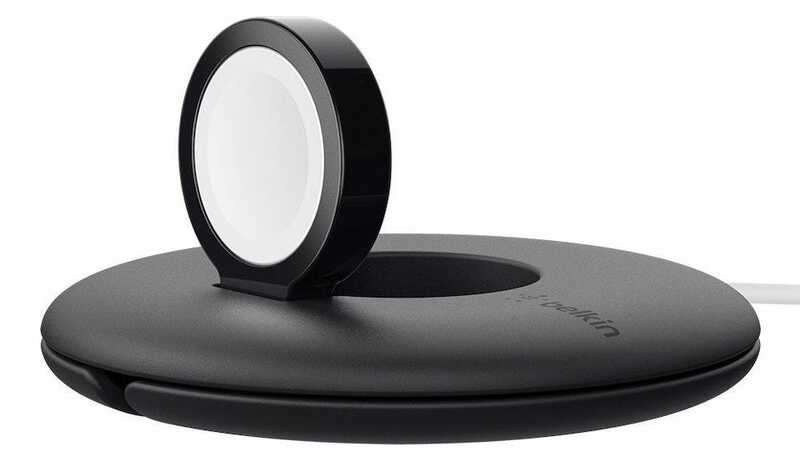 Looking almost like a work of modern art, the Belkin Travel Stand is straight forward enough to use. 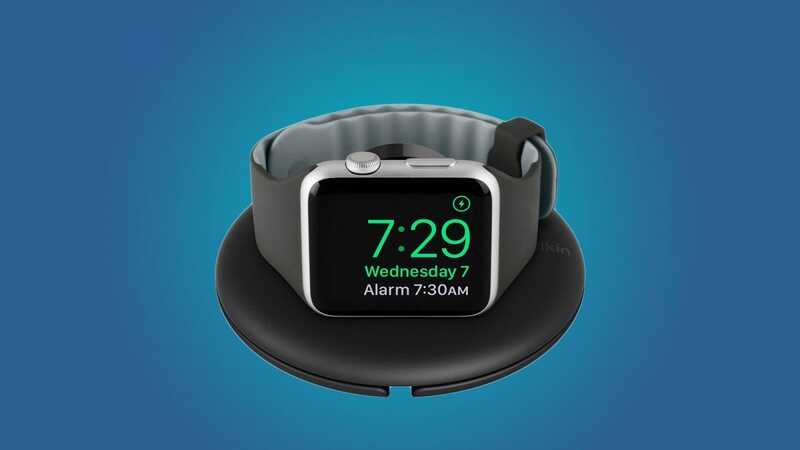 Its circular base conceals the magnetic charging puck which rises up for you to attach your Apple Watch to it. The base then keeps things steady throughout the night and easily allows you to leave the Apple Watch in Nightstand mode. As well as that, the stand easily stores up to 2m of Apple Watch charging cable so your workspace is neat and tidy, and the cable is kept safe from any potential issues. It’s easily small enough to toss into your bag too but good looking enough that you may find yourself using it at home. 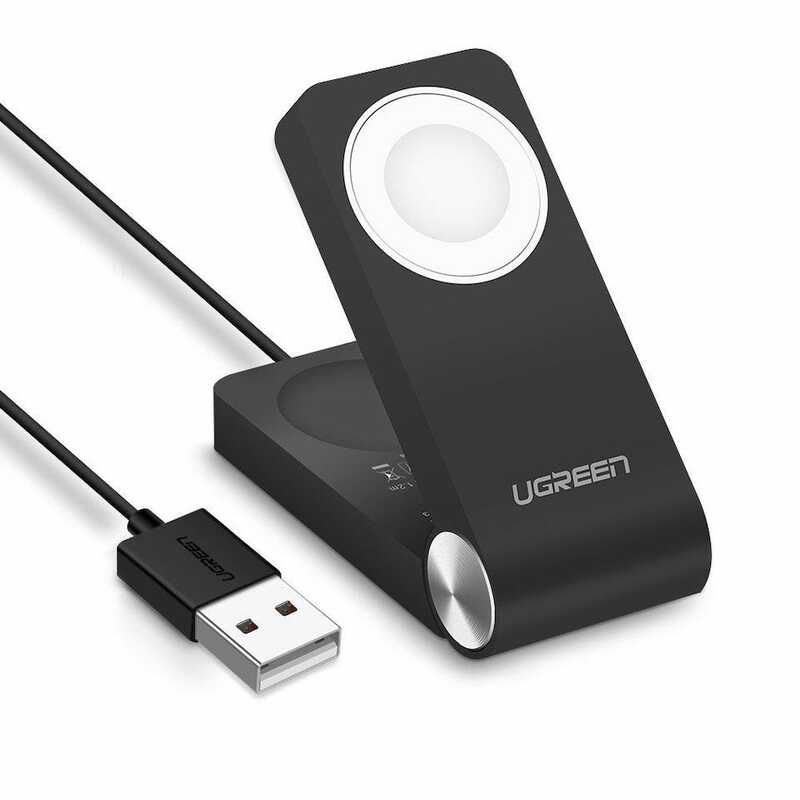 The UGREEN Charger offers a neat looking design. Foldable, you can flatten it down when carrying it around before pushing it back up to attach your Apple Watch to it overnight. It has a built-in magnetic charging puck so you don’t have to worry about taking your own cables with you either. The puck is also MFI certified and only takes about 2.5 hours to fully charge your Apple Watch so it’s on a par with the official charger. The UGREEN Charger design won’t look out of place on a hotel nightstand or when in the office, so it’s multi-purpose. Easily slipped into your bag and lightweight, you’ll find it simple to take around with you. Not every travel stand has to be expensive to work well. 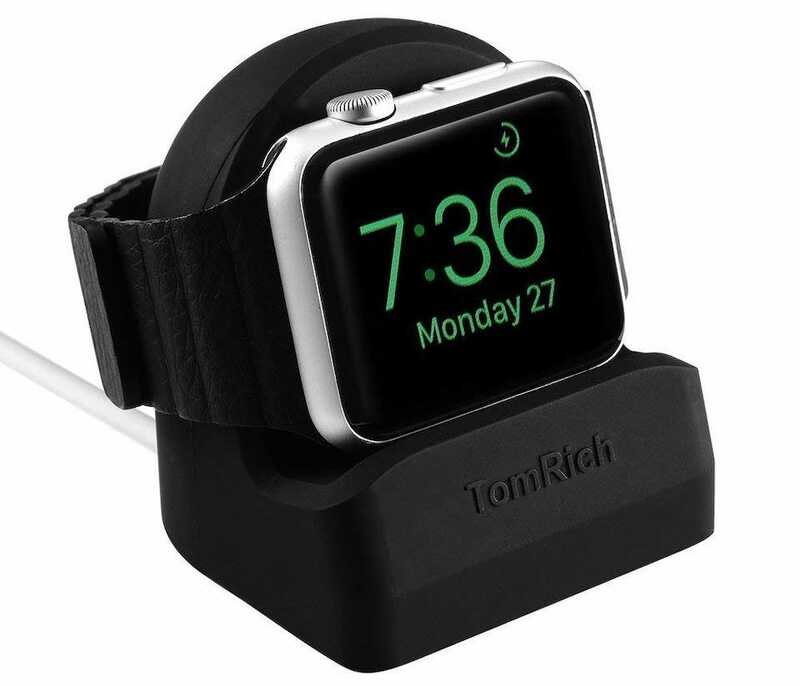 If you simply want a small plastic travel stand to prop your Apple Watch on at night then the TomRich Travel Companion is a good alternative. Made from durable and scratch-free silicone material, you can safely slot your Apple Watch on to it without any risk of scratching it. You need to use your own magnetic charging puck—which is to be expected given the price—but it easily slides into the side of the stand with a nice snug fit. The angle means it works well for switching your Watch into nightstand mode too. 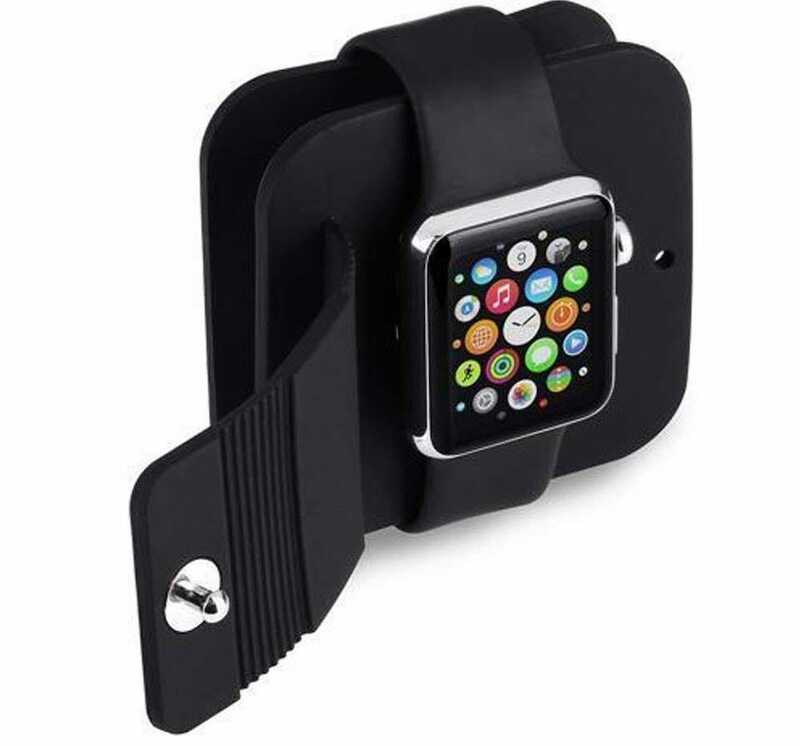 If you’re super limited for space then the Kinnara Apple Watch Charging Case could be the solution for you. It’s small enough to fit into your hand and wallet-shaped. Made from silicone, it’s durable and scratch-free so the ideal surface to place your Apple Watch on. You simply slide the Watch over the surface with a slot that holds the magnetic charging puck securely. There’s room for a cable winder and another slot to keep it tightly snug to the case. It’s not as smart looking as others here but if space is at an extreme premium, it’s ideal. Exercise bands are a great way to add in resistance training at home without the hassle of weights or bulky equipment. Here are our favorites.